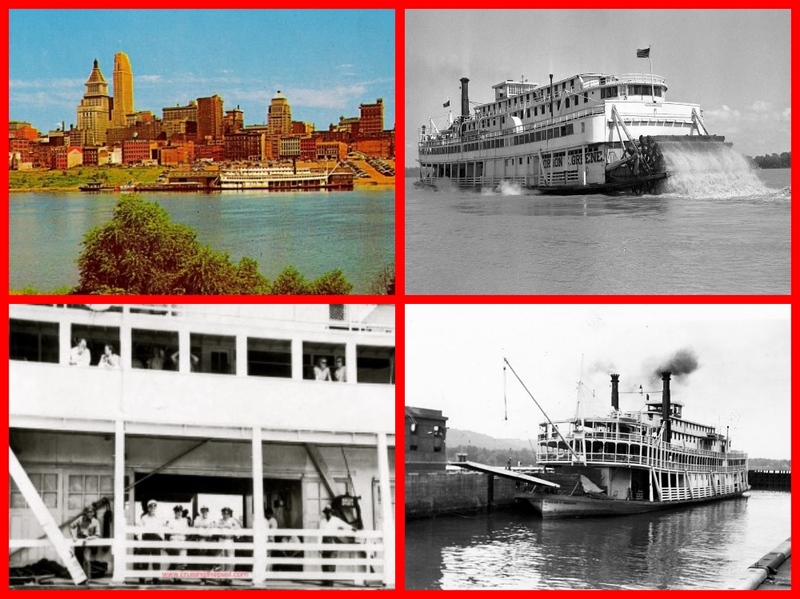 The GORDON C. GREENE sailed south on the Ohio and Mississippi Rivers – from Cincinnati to New Orleans and back. Nearly 70 years ago. When times were much different. The Gordon C. Greene heads down the Mississippi for New Orleans. Capt. 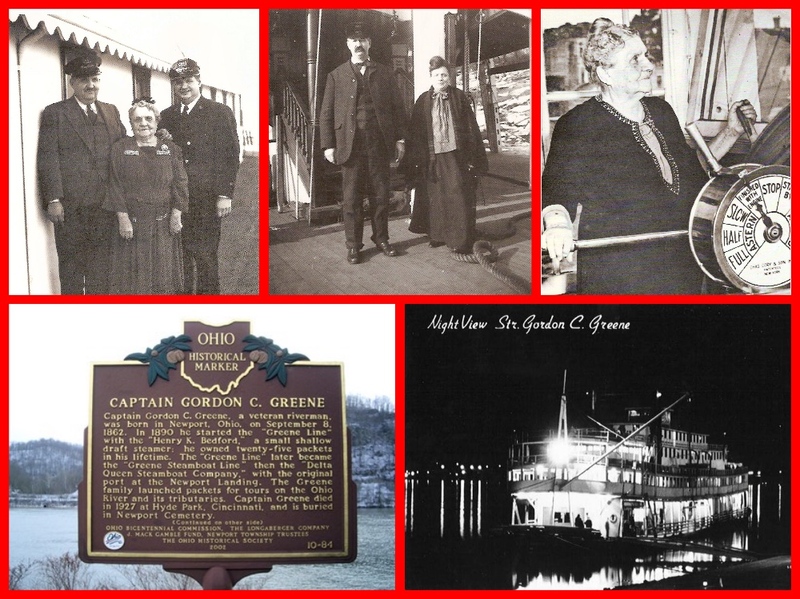 Mary Greene – co-owner of the Greene Line, and for 50 years the only woman pilot on the river. 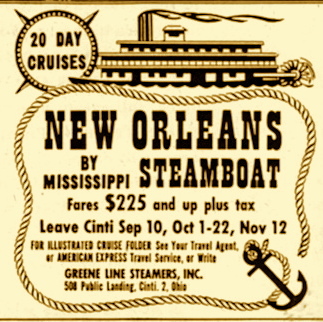 She also was hostess aboard the steamboat. The speed of the boat – was about that of the average of “Low Pressure” boats of Mark Twain’s time. The “Low Pressure” signs on the wheel housing of the Gordon C. Greene guaranteed that the steam would be kept well within the safety limits. The Gordon C. Greene was built as “Cape Girardeau” at the Howard Shipyard in Jeffersonville, Indiana, in 1923 for the Eagle Packet Company of Saint Louis. 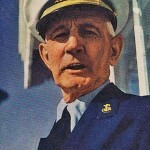 Captain William H. Leyhe hired Thomas Dunbar, an eminent riverboat architect, to design and supervise her construction. She was the last packet boat built at the Howard Yard and she was decorated in the old style with a lot of jig-saw drapery, feathered stacks, and a lofty dome on the pilothouse. Like many another steamboats, she was like a bride in that she wore ‘something old, something new, something borrowed and something blue’ when she came out. Her engines came from the Ferd Herold, built by the Iowa Machine Works. 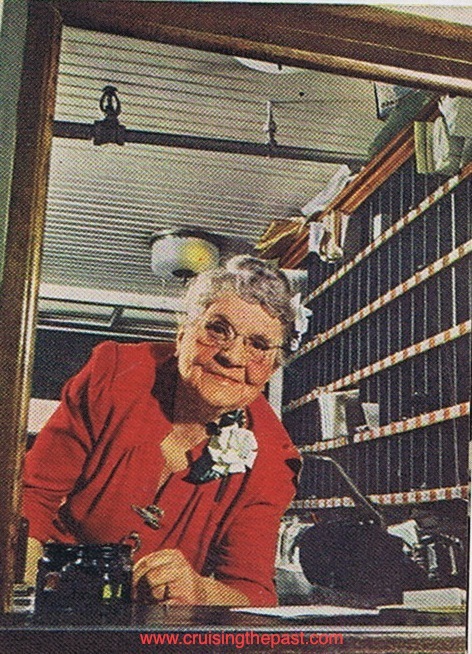 Her whistles came from another old Eagle packet, the Calhoun. Her hull and cabin were new. Her pilothouse dome gleamed in a coat of shiny blue paint as she entered her St. Louis – Cape Girardeau trade in April 1924. Gordon C. Greene docked in Cincinnati with another Greene Line riverboat; Gordon C. Greene on Mississippi and Ohio Rivers. She made history before she even touched the water. 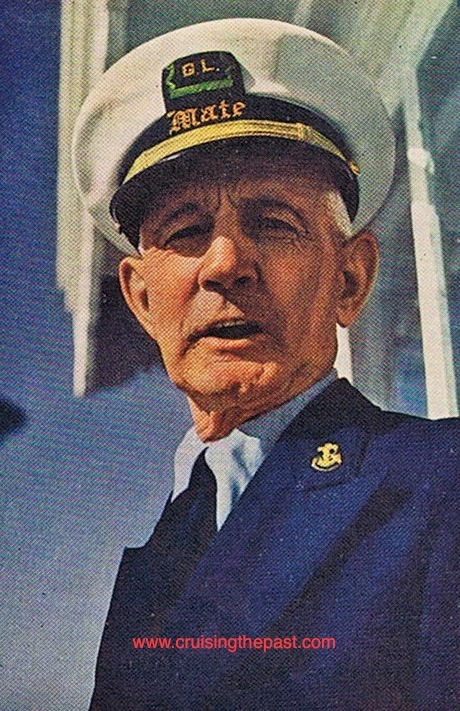 When Ed J. Howard died he left the operation of the shipyard in the hands of his two sons, Clyde and James E. Howard. They agreed that it would be best if Clyde ran the office while Captain Jim bossed the yard. 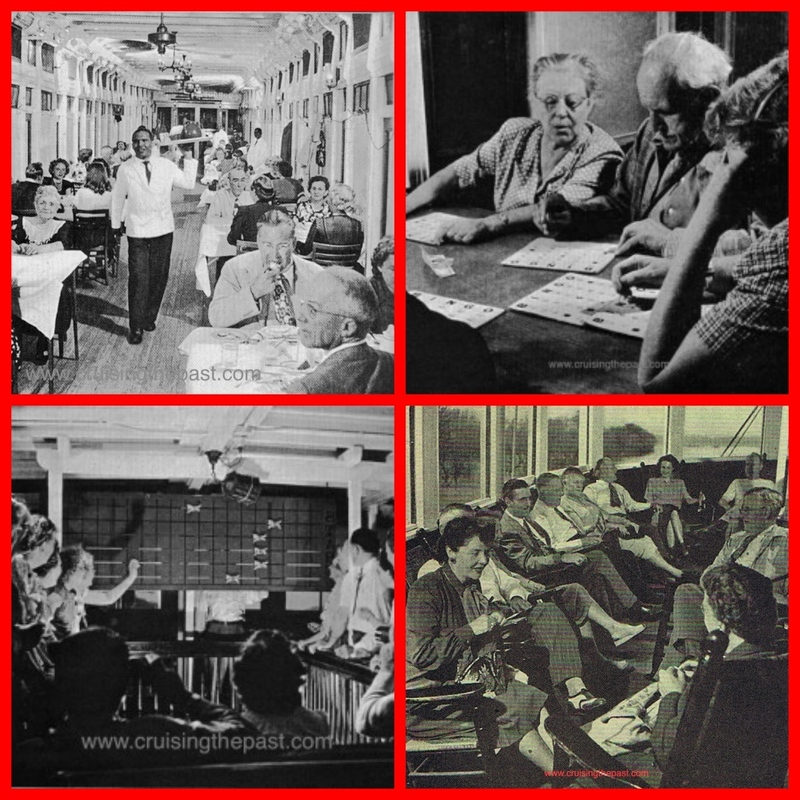 Clockwise: Dining Room: Passengers playing Bingo; Passengers on the shaded deck; Passengers playing the horse races. 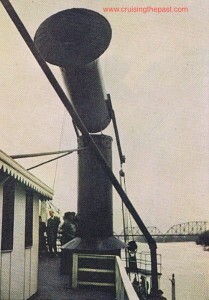 The day for the launch came and Clyde Howard went into the yard to supervise the work, much to his brother’s dismay. He made a good job of it, too. Later they met in the office and agreed that one of them should buy out the other. James E. Howard did the buying and ran the firm until the beginning of World War II. 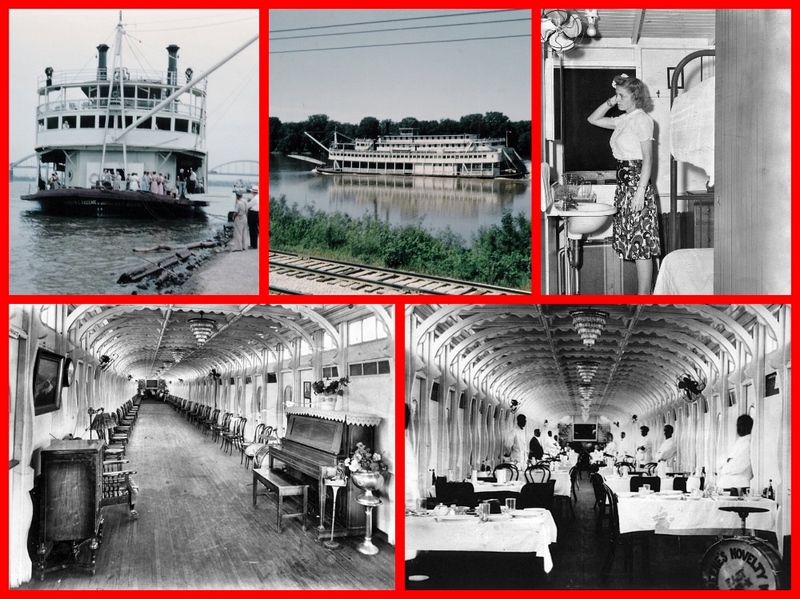 Clockwise: The riverboat landing; Riverboat heading down the river; Young lady in a cabin; The salon for relaxing and entertainment; The salon ready for dinner. 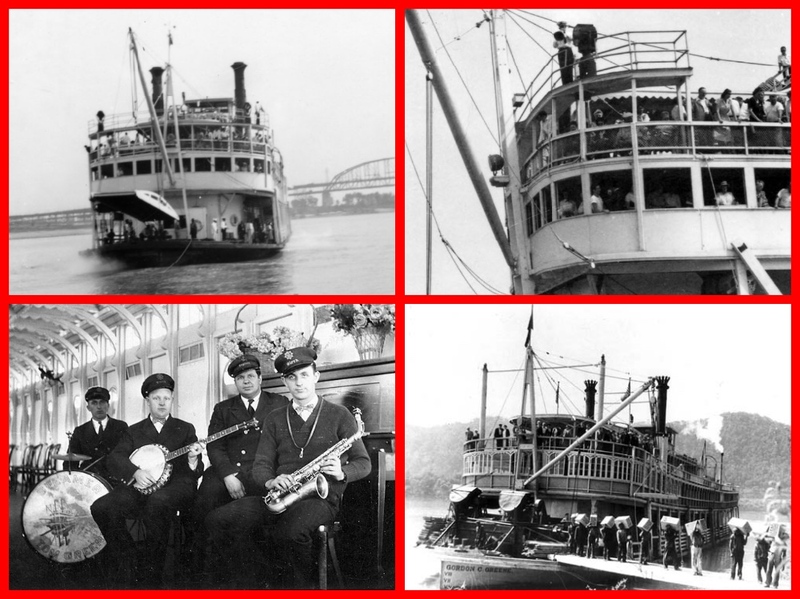 Greene Line family photos; the steamboat and memorial to the company. 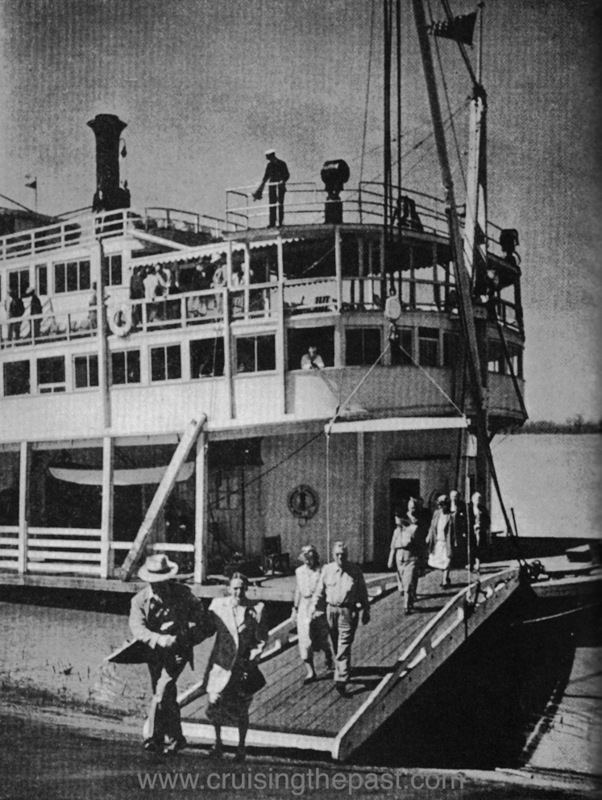 In 1936 Captain Tom Greene added a second Texas Deck to better accommodate passengers and in 1937 altered it again. The Gordon C. Greene on the river and the boat’s band. The result was to make her less pleasing aesthetically, but more attractive from a revenue standpoint, as these were the choicest rooms on the boat. Along with these changes, the names of various decks were revised as a move toward better public relations. (Left: First mate gives orders) A peculiar manifestation of our time was expressed by nearly everyone who’ rode her: “The first day on that boat I thought I’d go crazy! There was absolutely nothing to do. 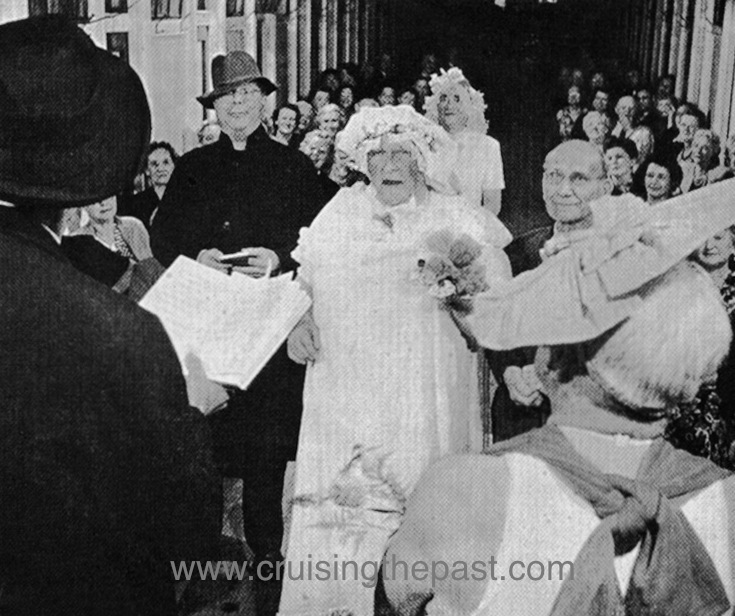 But after the second day, I found myself enjoying, for the first time in my adult life, the luxury of doing nothing.” Entertainment on board was homespun, of the audience participation type, such as bingo, square dancing, and amateur acts by members of the crew. After seven to twenty-one days of this, each passenger felt like a member of the Greene Family. 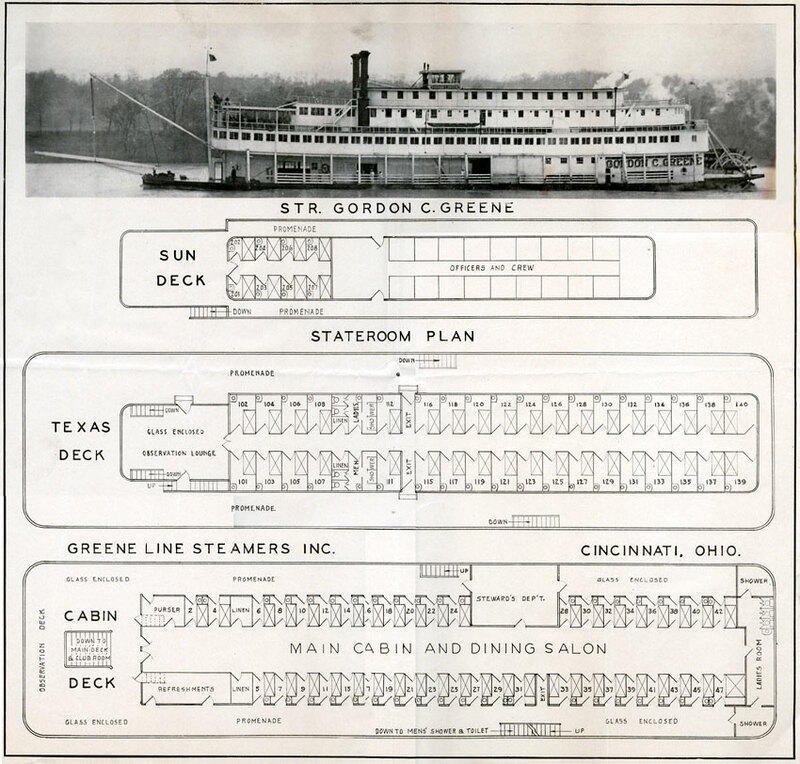 Aboard the steamboat – and the deck plan. 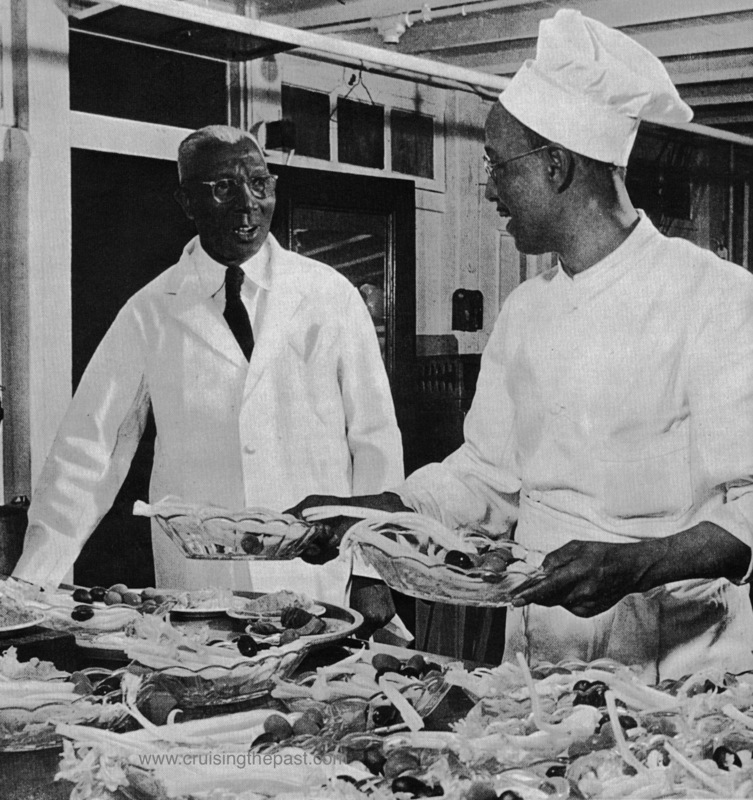 In 1946 Captain Tom Greene had an idea, and the idea was practically a reality. 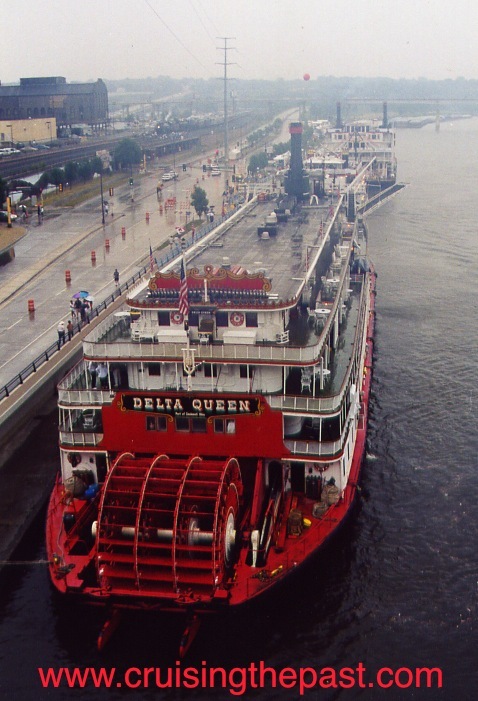 He wanted to bring the Delta Queen around from Sacramento to the Mississippi, and so he did. 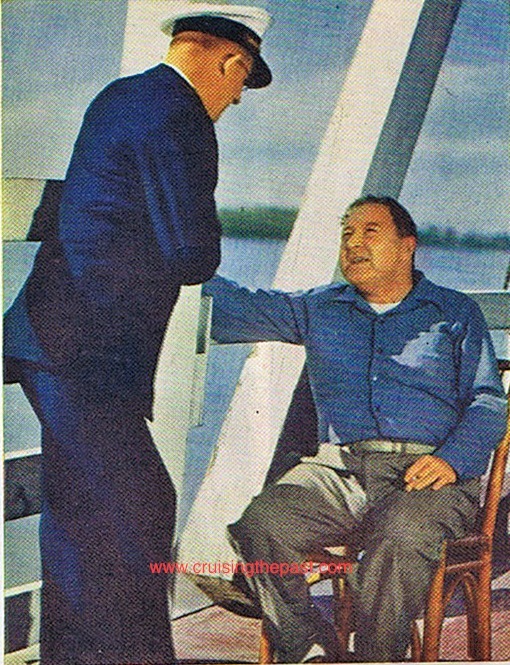 On June 30, 1948, the Gordon C. Greene was deposed as the ruler of the rivers by the larger boat. 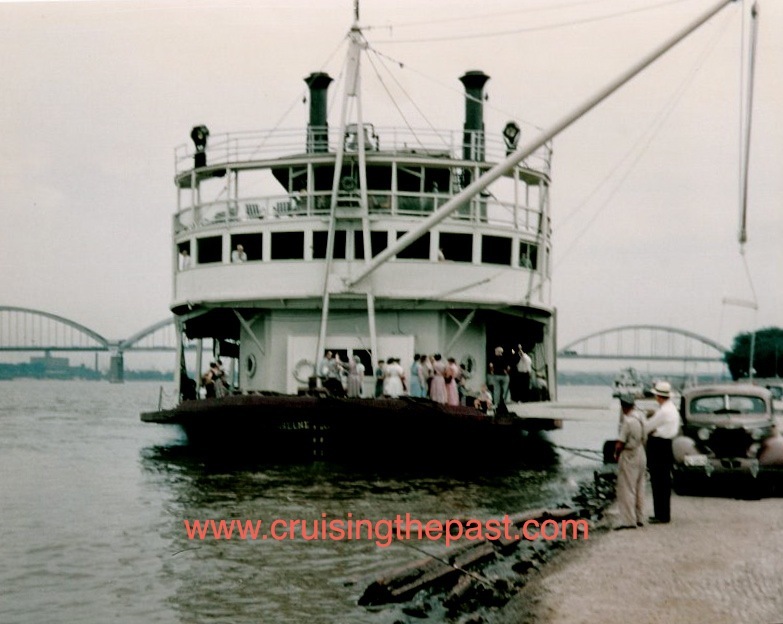 She was placed in Upper Mississippi River tourist service, but this blow seemed to ruin the old girl’s morale. She began to have the most unaccountable difficulties, even breaking her wheel shaft, and began to miss scheduled trips. 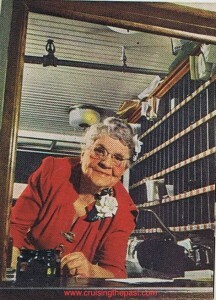 Her retirement came in 1951. 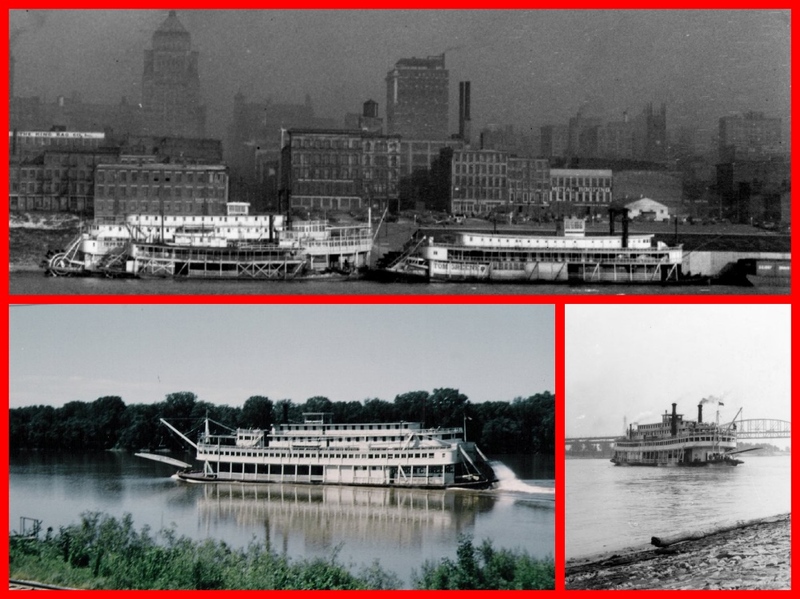 In 1952 the Gordon C. Greene was sold to Portsmouth (OH) and used as a hotel under the name “Sarah Lee,” in 1955 she was renamed “The Sternwheeler” and used as restaurant and museum at Owensboro (KY). 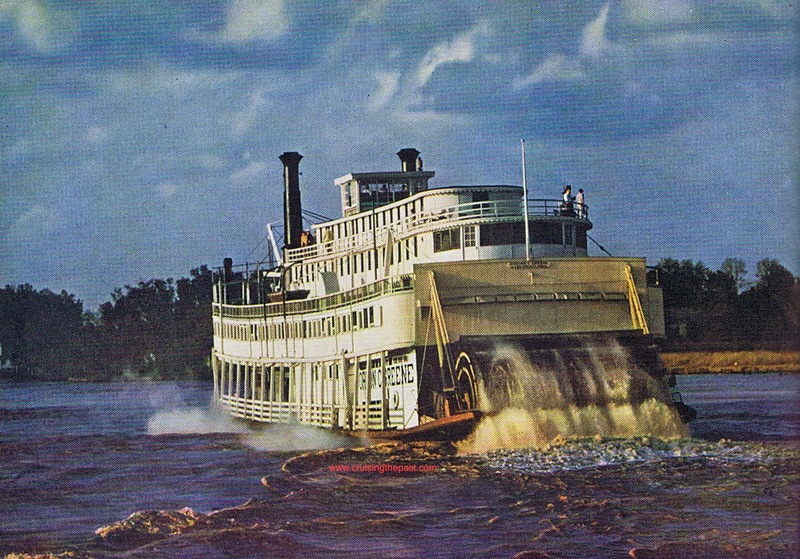 Sometimes she also spent a period of time as a floating restaurant at Tampa (FL). In 1960 converted to a theatre, bar and tourist attraction at New Orleans (LA). 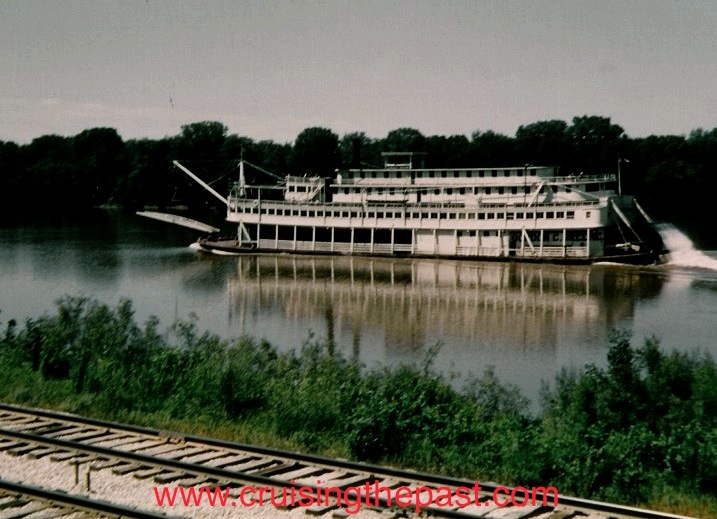 1961 sold to Hannibal (MO) for $49,100 and renamed to “River Queen”. 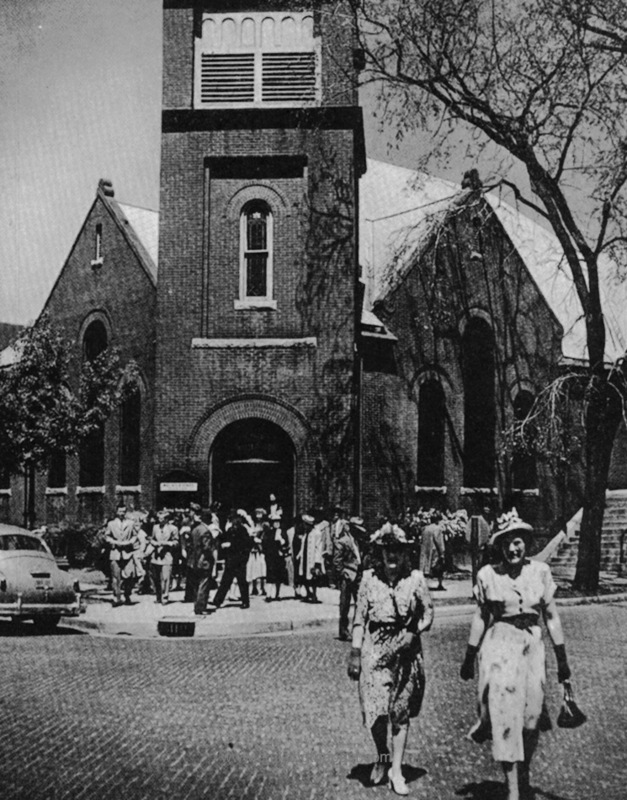 1964 moved to St. Louis (MO) and used as a restaurant.